And that was about the time when I was drawn the the “Fingers Looking Good” nails 😉 So I told her one day that I am going to quit biting nails. And I did, haven’t bitten a single nail ever since. I made a commitment, I told someone that I am going to do it. It’s one of my ways of committing to myself. My ego is big enough to force me to keep my word, even though breaking that word wouldn’t mean much. I cut my nails really really really short, so that I won’t have anything to bite even if I had to. Now you can’t beat that. I always carried my nail cutter in my bag ever since and whenever I feel like biting a nail, I cut the nail again then and there, really short. That works. Eventually, over time, I lost that instinct to bite my nails. 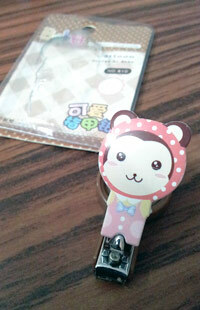 I still do carry a cute nail cutter (which she gifted me) in my bag all the time. My nails have grown in size a bit, but there is still a long way to go.